pseudoparanormal: Crop Circles: UFO's or pranksters? In the middle of the 1970's, circles impressed upon farmers fields began randomly appearing. This phenomenon continued into the 1990's, and it was believed that these circles were caused by flying saucers landing. Many people believed these circles were not pranks because there were no foot prints, and really no motive. The crop circles became more and more complex as the years went by, and also began showing up more often. Thousands of these figures were found throughout the United States, Canada, Bulgaria, Hungary, Japan, and the Netherlands. The media took immediate action on the topic. Best-selling books were written, and magazines, tabloid, and the news all wrote about the subject. All-night vigils were held to try to record a saucer landing in a field, but nothing was ever seen or recorded. In 1991, Doug Bower and Dave Chorley announced that they had been making crop circles for about fifteen years. They said that they would flatten the wheat with a steel bar, planks, and ropes. As they gained more experience, they would create more complex figures. They became angry when other crop figures began appearing in different areas by copy cats. The two men eventually became bored of the prank and confessed, but none really paid attention because crop circles created by aliens is much more interesting than crop circles created by two men. Crop circles continued, and confessions by other people who created crop circles were ignored. So, clearly crop circles were not created by UFO's landing on Earth, they were just a hoax. Emilee, I also chose to read Carl Sagan's book for my report. I find it very interesting that although a logical explanation was provided for the crop circles, and "perpetrators" even came forward, that people still choose to believe in the supernatural. I guess it is more fun, like you said, to believe that there is something greater and unknown among us. I like how you where able to condense the all of the information on crop circles in to an easy to read form. It sure would have be fun to be one of these pranksters and sit back a laugh as people thought it was aliens! I remember reading about crop circles, and seeing photo graphs of where to Alien space ships had landed, and wondering how they were really made. There where so many of them and I found it baffling that no one had seen them being made. It’s interesting how choose to believe some things without requiring a shred of evidence. I find it surprising, and sad that we, as human beings can be and are so easily manipulated. I view Carl Sagan’s sentiments to be correct when I find that science defines, and is the backbone of reality. 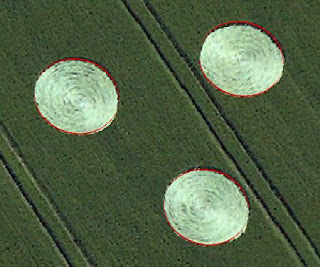 It's really funny how someone thought these crop circles were placed by aliens when crop circles can be created with basic technology. The Nazca lines have existed for hundreds of years, and it's made in a similar way by easily brushing away a discolored top layer of soil off of rocks. And of course, some people still often believe both of these simple phenomena were created by aliens.